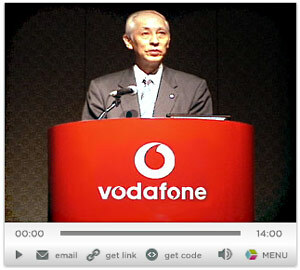 For Vodafone Japan, the end came not with a bang, but with a whimper. When we arrived at last Monday’s press event – the final one, it turned out, before news of the Japan sell-out hit the Web – the smell of pending doom hung in the air. Ironically, the media briefing bore an optimistic title: the “Future Direction of Product & Service Development.” It was also surprising to see that President Bill Morrow and Chairman Tsuda-san would attend for the 3G roadmap briefing to be given by former J-Phone super-star Ohta-san; WWJ has never seen three Vodafone Big Guys in one room together for a media briefing (perhaps there is safety in numbers)? But when the talk from all three turned out vague and totally avoided any mention of new MVNO’s signing up to resell Vodafone 3G capacity — widely considered to be one of Big Red’s few viable options in Japan — we suspected something was up. And when we learned that a $49 bn write-off had been announced by London on the same day, it was obvious that the clock had already started ticking down for the carrier’s long-speculated Japan exit. Thus ended, after some five years of trying, what could have been one of the most brilliant tie-ups between a global brand name and world-leading Japanese mobile know-how. It’s ironic, also, that last week’s presser actually showcased some technology and services that could have noticeably boosted the carrier’s oh-so-slow growth in 3G users. Not in recent memory has any of Japan’s Big Three carriers made five handset or service announcements in one day. The new 904SH [.pdf] is a great-looking piece of gear that could without a doubt follow in the footsteps of earlier Sharp handsets and make it into Europe. The VGA screen is super crisp and the onboard 3.2-megapixel camera — combined with FeliCa, Bluetooth and improved motion control sensor technology — stands to be popular both in Japan and elsewhere. They also turned some heads with the new OTA (over the air) update service based on software from InnoPath and a pre-loaded face recognition function provided by Oki Electric (which we think is actually the Okao Vision application developed by Omron; video here). Despite Vodafone’s seismic sell-off and the pending transfer of ownership to Masayoshi Son, remember that the carrier has to carry on, and WWJ was able to scrape out several notable gems on future plans from the press briefing. As an exclusive value add to our paid subscribers, the full-length video from Ohta-san’s presentation (plus follow-on Q&A) is available after log-in — as is a deeper discussion about the recent news. 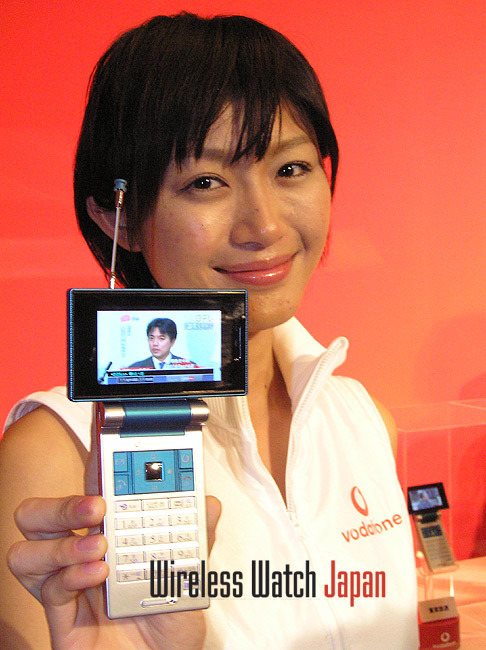 Several of the interesting topics covered were not made openly available after the briefing — such as this prototype TV handset, which is certainly not Sharp’s new 904SH. In total, the company announced five new products last week: the 904SH, Bluetooth-based v-Applis (allowing multiplayer games that avoid all network fees), the face-recognition feature, the OTA software upgrade service and the improved motion control sensor. Ohta-san’s presentation indicated that the company has — better late than never, we suppose — awakened to the reality that P2P communications, community portal blogging and highly sophisticated handsets are what customers really want — and are already getting from Japan’s No. 2 player KDDI/au. While technology like face recognition and motion control sensors might seem a little gimmicky, recall that Ohta-san’s last gimmicky, tech-based service — Sha-mail (picture mail) — developed into a global phenomenon and it will be worth watching what happens with the motion sensor and Bluetooth v-Applis (for gaming) and face recognition (for security apps). The overall feeling was that local management was — to be polite — not very forthcoming, understandable, perhaps, given that managers must have already known about the the pending sale. Whether it was shock or simply an accelerated sense of doom, some of the statements were clearly disconnected from reality. In particular, Bill Morrow’s comment during the Q&A (.mp3 here) that the $49 bn write-down just announced by London would have “no impact to us here in Japan,” and that “our strategy, our operation, is going to be exactly as it was before” were unrealistic to say the least. Note that as many former J-Phone employees moved over to Softbank around the time that past president and CEO Darryl Green resigned, the transfer of ownership would in fact constitute a reunion of sorts. However, the vision laid out by Ohta-san for the company’s future direction was encouraging and it will be interesting to see if and when new owners Softbank can execute on this (or formulate their own??). Overall, the product and service announcements from last week can at best be considered tentative until the new owners get into the driver’s seat.